Expect builds of the finest quality in a tour of available residences at Artistry Sarasota. After all, this is the first Sarasota community of single family homes for its builder, the West Palm Beach-based Kolter Group. Surely, it would set its best foot forward in this development. 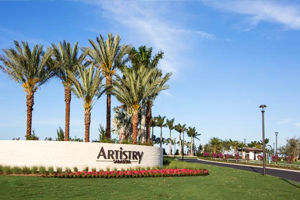 Artistry Sarasota homes for sale are located in a parcel of about 400 acres at the eastern terminus of Palmer Boulevard right at its junction with Iona Road. The Palmer Boulevard corridor notably links to several arterial roads which lead up to various commercial hubs as well as life and leisure centers not only in Sarasota but also in Bradenton and Lakewood Ranch. The community’s sprawling layout is quite impressive with roads winding around several lakes occupying a total of 100 acres. Kolter set Artistry Sarasota homes for sale in a gated enclave with an elevated entrance for an immediate glimpse of the community’s picturesque water views. Even more pleasing to residents and prospective home buyers, 90 percent of the community’s home lots are platted adjacent to a lake or have overlooking views of the water. 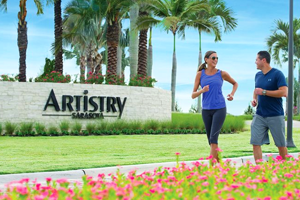 The development of Artistry Sarasota meticulously blends rural and urban elements. This mix serves as the framework for a healthy, resort lifestyle that this community seeks to provide tis residents. To achieve this theme, the Artistry Sarasota development includes a lakeside clubhouse featuring a fitness center, sports courts, tot lot and a swimming pool. The community likewise features paved paths and a trail system totaling 21 miles. These pathways built out of natural materials link the community’s neighborhoods with the property’s preserve areas. The initial site plan of Artistry Sarasota provides for 319 residences, with plenty of space still left for future homebuilding. 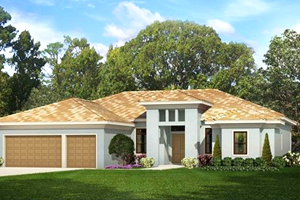 Six of the planned 10 models in this community were opened for showing in April 2017, while two builds for completion late in the year were sales-listed amongst Sarasota homes for sale with tag prices in the $500s. One of these inventory homes of Kolter, the Chagall, is a two-story design with a floor area of more than 3,600 square feet featuring four bedrooms and five baths. The other is the Monet designed with three bedrooms, three baths and a half-bath within its floor area a shade over 2,560 square feet. Artistry Sarasota homes for sale generally have open floor plans that allow maximized use of space. Kolter has a Homes’ Design Gallery enabling home buyers to customize the floor plans to suit their needs and preferences. They can also incorporate outdoor living areas or choose the structural and finish options that suit their own individual style. The concept of healthy living and sustainable building practices is expressed in Artistry Sarasota’s home designs in several ways. Kolter’s builds in this community come out as smarter and healthier home renditions with their ceilings of up to 11 feet and four inches high to allow plenty of natural light to filter inside the residence. Electricity and water consumption in each Artistry Sarasota residence are conserved through energy-efficient appliances and plumbing fixtures. To help reduce utility cost and improve air quality, the homes in the community incorporate fresh air intake systems, thermal doors and windows, low VOC paints and carpets, and sealed duct systems. Given such features, the Palmer model available in Artistry Sarasota copped the 2017 Aurora Award for Best Single Family Detached Home in its category, thus underscoring the distinctive homes Kolter offers in this community. Below are the current real estate listings available at Artistry Sarasota.